One hotel and five buildings belonging to three suspected kidnappers and armed robbers who kidnapped and murdered a chieftain of the All Progressives Congress, Amos Akano, have been jointly demolished by the Imo State Police Command and the Imo State Government. The demolition of the hotel and five buildings on Saturday in Mgbidi, Oru East Local Government Area, came shortly after the arrested kidnap kingpins identified as Ikenna Nwosu, also known as Ezego, and two others, Eze Chukuwu (Sepia) and Chidi Anyiam (Senator), reportedly confessed to the murder and other criminal activities. 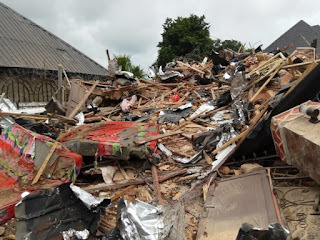 According to Punch, a state security formation, Imo Security Watch and the operatives of the state Police Command carried out the demolition of the hotel and the buildings, which was witnessed by villagers. Speaking to newsmen on the demolition of the buildings owned by the three kidnap kingpins, the State’s Police Public Relations Officer, Mr Andrew Enwerem, said the destruction was in accordance with the state law. According to him, the suspects made confessional statements informing the police where the hotel and buildings were located and how they made money to build them. It was further gathered that the gang was also responsible for the abduction of Daniel Akukanwa, Anayo Ihegbe, Patricia Okoronkwo, Obijuru Kechinyere and Ndebelie Edwin. “The demolition was carried out by the state government. We were only there to provide security and make sure that there was no breakdown of law and order. 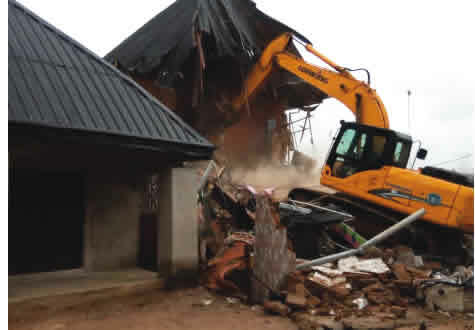 “The suspects whose hotel and five buildings were demolished were responsible for the kidnap and murder of a chieftain of the All Progressives Congress in the state, Amos Akano. They have committed other atrocities. “The demolished buildings and hotel are proceeds from their heinous crimes. It is a law in the state that buildings that were acquired through abductions would be demolished in order to dissuade others from taking to the business of abducting people for ransoms,” he said.